Friday was the highly successful, Social Networking for Innovation conference. 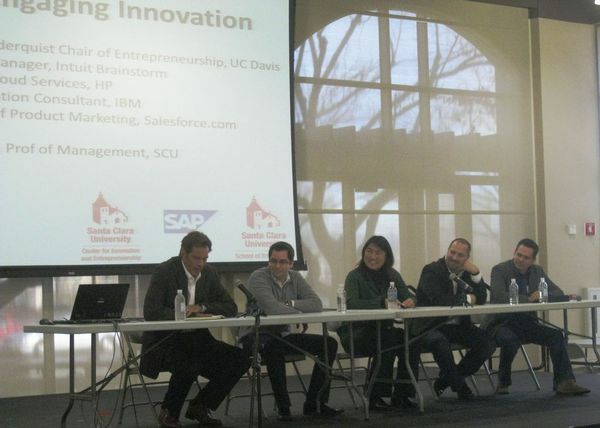 The panels took place in Santa Clara University’s new Locatelli Student Activities Center, sponsored by SAP, SCU’s School of Engineering and Center for Innovation & Entrepreneurship, and were presented by the Bay Area IT Executives Meetup. Over 65 executives, consultants, students, and faculty joined in the event. As moderator, I did my best to engage the audience in conversations with the panel. As a result I didn’t have the chance to ask all my own questions. This post is a chance to do that, and to share with you the wonderful backgrounds of the panelists and the exiting topics they work on every day. Give me a day or two to ponder and I’ll add some of my own insights from the panels. David Cruickshank: Director of the Co-Innovation Lab @ SAP -- a spectacular example of open innovation. David is an alumni of our MSIS program at SCU and contributor to the SAP Blog. Question I wanted to ask: Intellectual property -- What did it really, really take to get all these organizations (including competitors) to work together in COIL? Was it all about the lawyers and strategic value, or did personal relationships, private meetings, beers, etc. play a role? Prof. Joel West: Professor of Innovation & Entrepreneurship at the Department of Organization and Management in the College of Business at San José State University, Co-editor of the book Open Innovation: Researching a New Paradigm, author of the Open Innovation Blog and co-founder with Henry Chesbrough of the Open Innovation Community. Question I wanted to ask: Solar -- You’re director of the SJSU Solar Workforce Project. Is it easier or harder to use social networking for innovation in a new industry? Hutch Carpenter: VP of Product for Spigit -- I've known Hutch through his blog which provides great value to people learning and implementing social effects around innovation. Question I wanted to ask: What has been the most interesting take away from your experiences in supporting organizations with their external facing contests? After all these projects, are their still surprises? Jim Newton: Jim sent me my favorite of all the bios - and it’s all true - "Jim is an uber-DIY'er and lifelong maker. A serial entrepreneur, Jim holds several design patents and created TechShop because he needed a place to build his own inventions. Before founding TechShop Jim was a BattleBots competitor and former Science Advisor on the Disney Channel’s top hit show "MythBusters." Question I wanted to ask: How can educators stimulate a maker mentality? Prof. Andrew Hargadon: Soderquist Chair of Entrepreneurship, Graduate School of Management, UC Davis, Author of the book, How Breakthroughs Happen, Senior Fellow at the Kauffman Foundation, and founding director of two key centers at the University of California, Davis—the Center for Entrepreneurship and the Energy Efficiency Center—and is at the forefront of teaching, research, and practice in cross-disciplinary entrepreneurship. Question I wanted to ask: You've said that networks are central to the innovation process. What are the management issues around whether these networks will “shackle your organization or set it free” [Andy’s terms]? Tad Milbourn - Product Manager for Intuit Brainstorm, Intuit’s online innovation catalyst and winner of the Forrester Groundswell Award for Innovation Management. Question I wanted to ask: I know that Intuit supports innovation with both technology tools and organizational practice (showing their systems savvy) -- what do you think is the most important organizational practice you can suggest to the external clients of Brainstorm? Susie Wee: CTO, Client Cloud Services, HP. Technology Review's Top 100 Young Innovators award (2002) to ComputerWorld’s Top 40 Innovators Under 40 -- and of course, an avid hockey player! Question I wanted to ask: You’re known for your expertise around teamwork in innovation. How to you keep the positives of teamwork while avoiding the possible downsides, like groupthink? Wolf Cramer - Transformation Consultant at IBM, serves on the Board of an intrapreneur contest program at IBM and is an alum of SCU’s EMBA program. Master Catalyst for helping ideas contributed to IBM's idea platform (ThinkPlace) get developed into prototypes. Question I wanted to ask: Companies have looked worked with intrapreneurship for a long time -- is what we're seeing now different? Has the spread of social networking for social reasons enabled new practices around social networking for innovation? Robin Daniels - Director of product marketing at Salesforce.com. Prominent advocate and expert on Enterprise Cloud Computing and how it is transforming enterprises and the software industry. Question I wanted to ask: Salesforce has great access to our biggest companies, both in the US and globally, do you see differences across different countries or cultures in social networking for innovation? Here’s hoping our panelists have time for some answers. Until then, consider posting your own answers and take a look at panelists Wolf Cramer and Joel West's summary blog posts, and the twitter feed for the event. Panelists and audience members summarized as they listened to each panel.